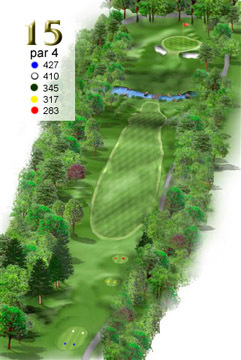 Par 4, straight ahead, down the hill then back up and over some water, onto a green that's hard to hold. The number one handicap hole on the course and you'll see why. Again trees on both sides and to the back of the green. A shot over the green could be hard to hold coming back, so be careful. A par here is a good score.